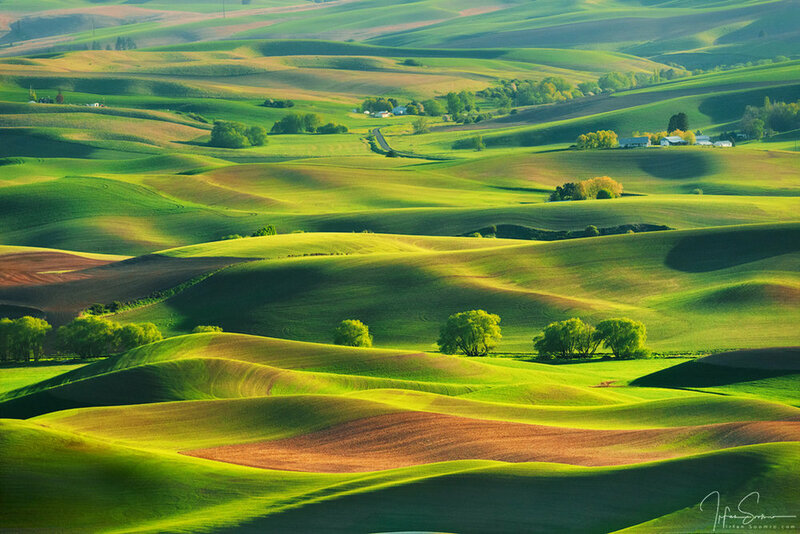 The Palouse is a region of the northwestern United States, encompassing parts of southeastern Washington, north central Idaho and, by some definitions, parts of northeast Oregon. It is a major agricultural area, primarily producing wheat and legumes. 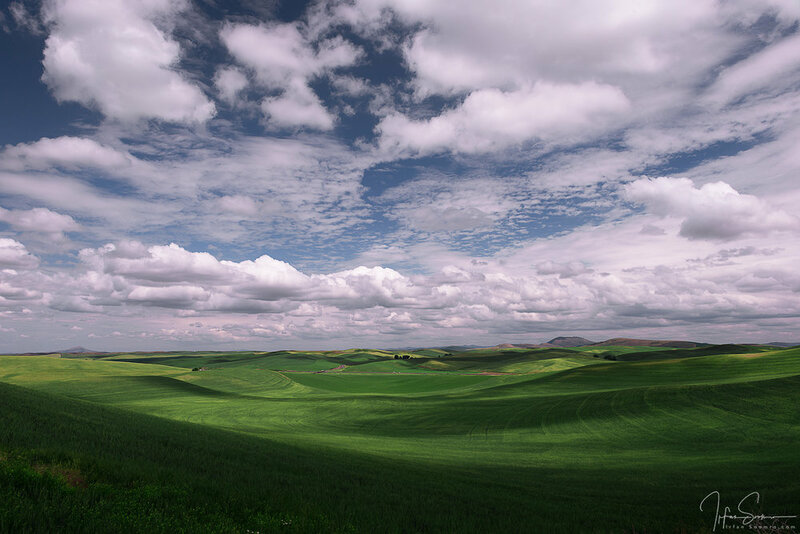 The entire core of Palouse area is among one of the most beautiful and photogenic areas in the Pacific Northwest and any photographer's dream. Miles and miles of gently rolling hills of wheat, barley, peas, lentils and canola mean spectacular panoramic views offering tremendous composition opportunities and a sense of serenity. Peak season brings hues of gold and greens in a very artistic way. A number of my best selling, award winning and published images have come from this region. 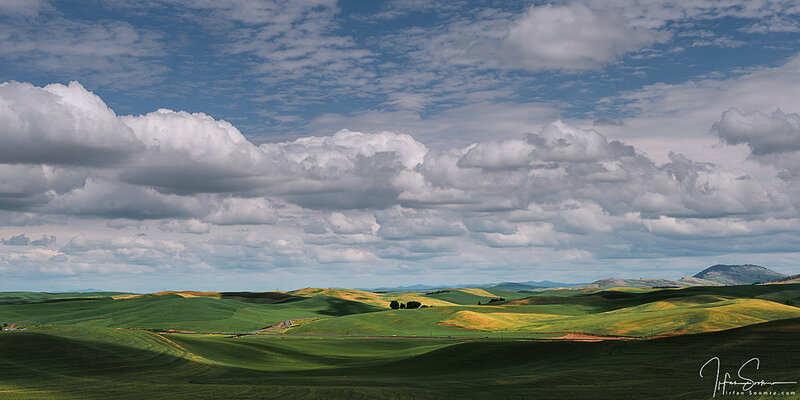 Palouse workshops are very high in demand due to the photographic potential. If you are considering investing in your photography for 2018, don't delay in registering. This 3 day on location field workshop is offered @US $995. It will take us through the rolling hills, country roads dotted with 100+ year old barns, high buttes, classic farm houses, old rustic farm equipment and an extremely photogenic waterfall. All these offer photographic elements in abundance and there is no shortage of subject matter throughout the workshop. We will start with pre-sunrise meet on Friday and culminate the workshop after sunset shoot on Sunday. More detailed itenerary will be emailed to each registered participant. During the workshop we would follow a loosely defined schedule giving us flexibility to take advantage of the best light. To truly get the best of images and learn the skills of shoot in variety of light conditions we will revisit some spots more than others. We will spend morning and evening hours shooting in the field with “Post Processing and Image Critique” sessions during midday hours. Throughout the workshop we will discuss artistic and technical aspects of photography. Topics like camera settings, right tools for a given scene, field techniques and tips, composition and other questions you might have. I am also open to discussing additional topics throughout the workshop like Developing Personal Style and Vision, Self-printing, Soft Proofing for commercial lab printing, marketing and selling fine art. Coalfax and Pullman in WA side and Moscow in ID side are the bigger towns that offer good accommodations for the workshop. Seattle and Portland (about 5 hours drive) and Spokane (about 1.5 hours drive) are the nearby airports. Irfan Soomro Photography is fully licensed and insured business and I conduct my workshops with applicable permits and operate under the rules and regulations of the respective park services like State Parks or National Park Service etc..
To reserve a seat or have any question you can reach out to me via my home page or message / call me at my cell: 425-891-1362. Once I receive registration request I can send you invoice to process payment. I hope you are able to join me and look forward to helping you take your photography to next level. This 3 Day workshop is priced at US $995 with 50% payment due at registration to secure your seat. and balance 50% due by March 15th, 2018. Logistics: Flying In: SeaTac or Portland Int'r – about 4.5 hour drive. Driving: Any road worthy vehicle. We will be driving on paved roads.